May 14, 2018: Scientists re-examining data from an old mission bring new insights to the tantalizing question of whether Jupiter’s moon Europa has the ingredients to support life. The data provide independent evidence that the moon’s subsurface liquid water reservoir may be venting plumes of water vapor above its icy shell. Data collected by NASA’s Galileo spacecraft in 1997 were put through new and advanced computer models to untangle a mystery—a brief, localized bend in the magnetic field—that had gone unexplained until now. Previous ultraviolet images from NASA’s Hubble Space Telescope in 2012 suggested the presence of plumes, but this new analysis used data collected much closer to the source and is considered strong, corroborating support for plumes. The findings appear in Monday’s issue of the journal Nature Astronomy. The research was led by Xianzhe Jia, a space physicist at the University of Michigan in Ann Arbor and lead author of the journal article. Jia also is co-investigator for two instruments that will travel aboard Europa Clipper, NASA’s upcoming mission to explore the moon’s potential habitability. “The data were there, but we needed sophisticated modeling to make sense of the observation,” Jia said. Jia’s team was inspired to dive back into the Galileo data by Melissa McGrath of the SETI Institute in Mountain View, California. A member of the Europa Clipper science team, McGrath delivered a presentation to fellow team scientists, highlighting other Hubble observations of Europa. At the time of the 1997 flyby, about 124 miles (200 kilometers) above Europa’s surface, the Galileo team didn't suspect the spacecraft might be grazing a plume erupting from the icy moon. Now, Jia and his team believe, its path was fortuitous. When they examined the information gathered during that flyby 21 years ago, sure enough, high-resolution magnetometer data showed something strange. Drawing on what scientists learned from exploring plumes on Saturn’s moon Enceladus—that material in plumes becomes ionized and leaves a characteristic blip in the magnetic field—they knew what to look for. And there it was on Europa—a brief, localized bend in the magnetic field that had never been explained. Galileo carried a powerful Plasma Wave Spectrometer (PWS) to measure plasma waves caused by charged particles in gases around Europa’s atmosphere. Jia’s team pulled that data as well, and it also appeared to back the theory of a plume. But numbers alone couldn’t paint the whole picture. Jia layered the magnetometry and plasma wave signatures into new 3D modeling developed by his team at the University of Michigan, which simulated the interactions of plasma with solar system bodies. The final ingredient was the data from Hubble that suggested dimensions of potential plumes. The result that emerged, with a simulated plume, was a match to the magnetic field and plasma signatures the team pulled from the Galileo data. “There now seem to be too many lines of evidence to dismiss plumes at Europa," said Robert Pappalardo, Europa Clipper project scientist at NASA’s Jet Propulsion Laboratory (JPL) in Pasadena, California. “This result makes the plumes seem to be much more real and, for me, is a tipping point. These are no longer uncertain blips on a faraway image." The findings are good news for the Europa Clipper mission, which may launch as early as June 2022. From its orbit of Jupiter, Europa Clipper will sail close by the moon in rapid, low-altitude flybys. If plumes are indeed spewing vapor from Europa’s ocean or subsurface lakes, Europa Clipper could sample the frozen liquid and dust particles. The mission team is gearing up now to look at potential orbital paths, and the new research will play into those discussions. 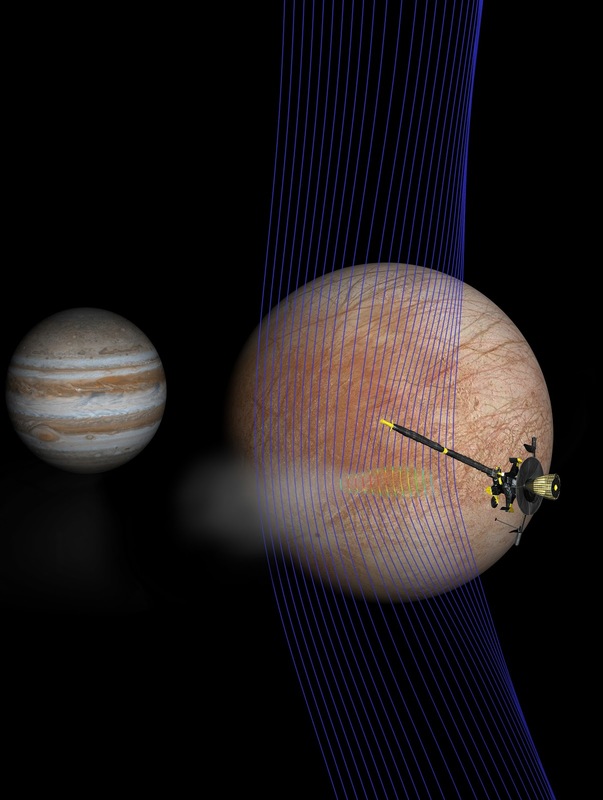 JPL manages the Europa Clipper mission for the agency's Science Mission Directorate. Artist’s illustration of Jupiter and Europa (in the foreground) with the Galileo spacecraft after its pass through a plume erupting from Europa’s surface. A new computer simulation gives us an idea of how the magnetic field interacted with a plume. The magnetic field lines (depicted in blue) show how the plume interacts with the ambient flow of Jovian plasma. The red colors on the lines show more dense areas of plasma.